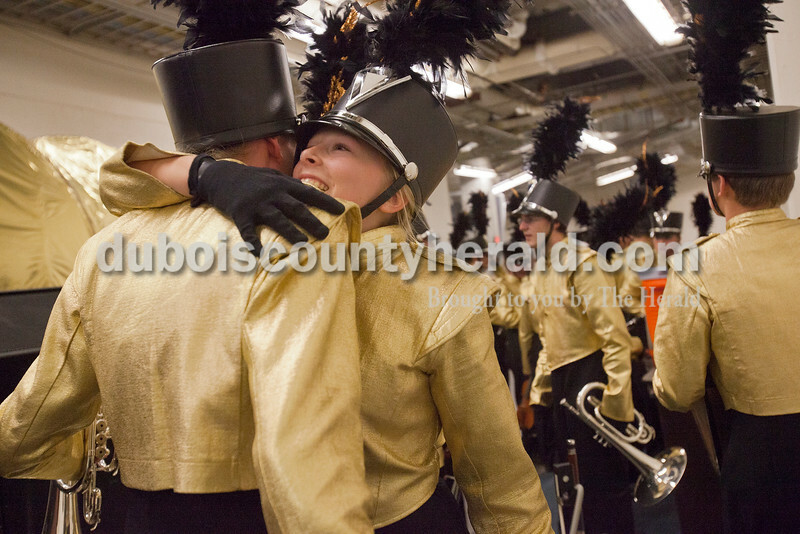 Jasper seniors Kayla Judy, Jacqueline Hurst, Emily Jones and Janelle Gore shared a laugh while waiting in the warm up room at the Indiana State School Music Association State Marching Band Finals in Indianapolis Saturday. 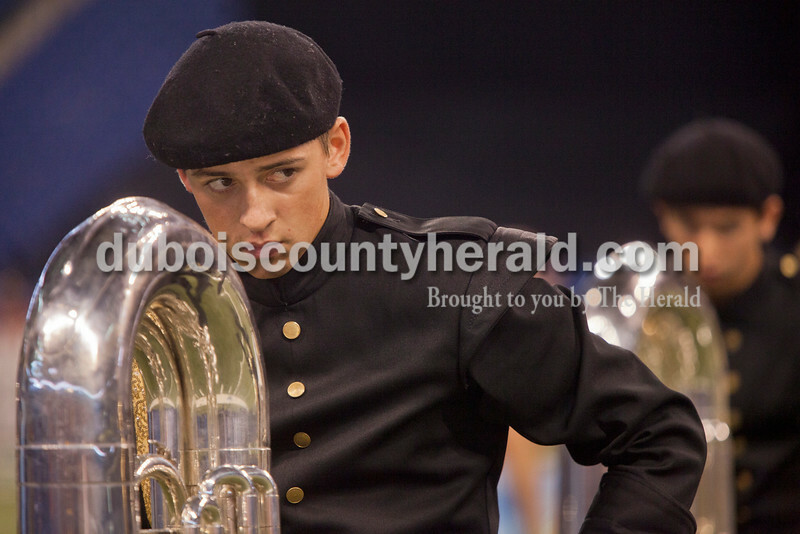 Jasper senior Steven Zehr warmed up with fellow baritone players at the Indiana State School Music Association State Marching Band Finals in Indianapolis Saturday. 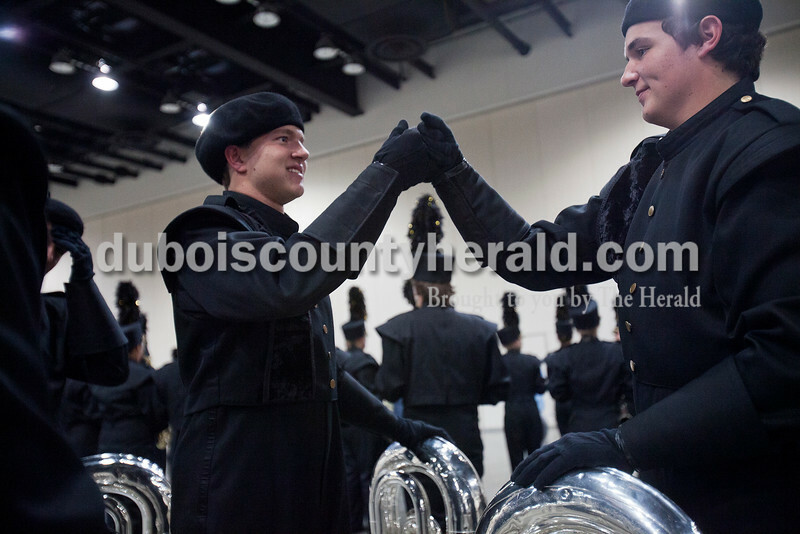 Jasper senior Kyle Fischer and junior Nick Montee bumped fists at the Indiana State School Music Association State Marching Band Finals in Indianapolis Saturday. 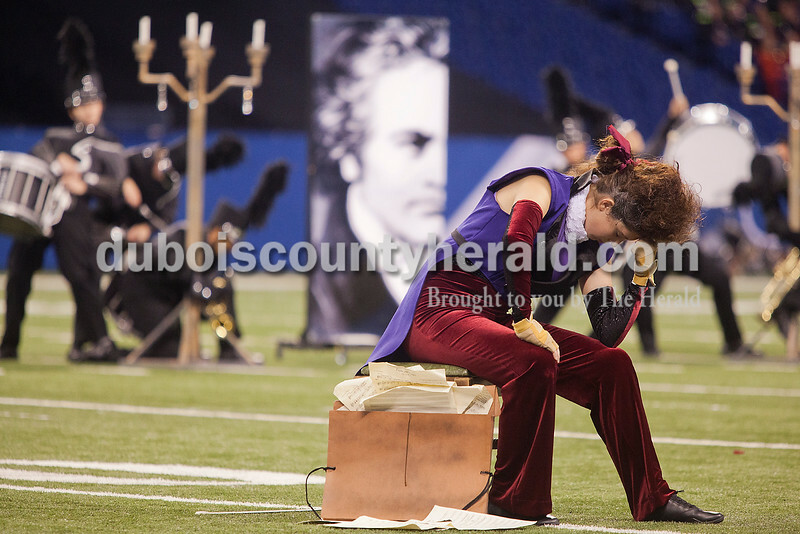 Jasper senior Maddie Messmer played a trumpet solo while senior Kari Keeley soloed on the mellophone in the background during the Marching Wildcats performance at the Indiana State School Music Association State Marching Band Finals in Indianapolis Saturday. 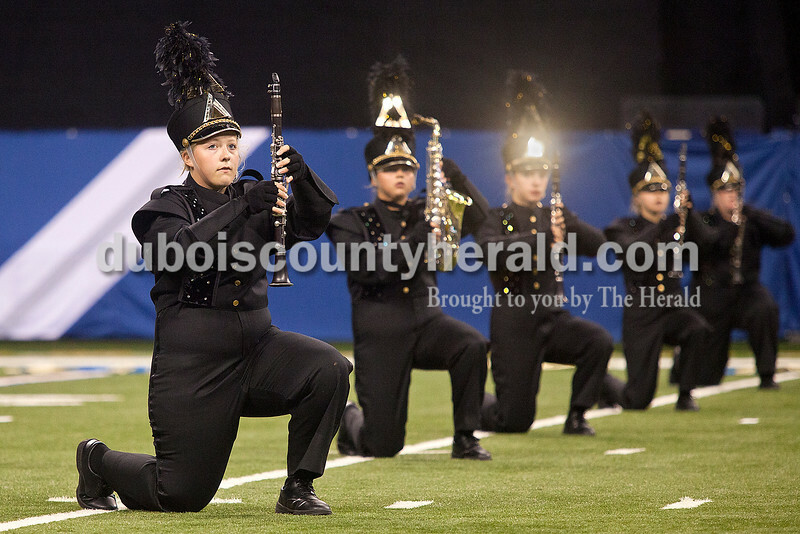 Jasper Marching Wildcats sophomores Ryan Fritz, Lindsey Welp, Madeline Keller and Maddie Robling took a knee in formation during their performance at the Indiana State School Music Association State Marching Band Finals in Indianapolis Saturday. 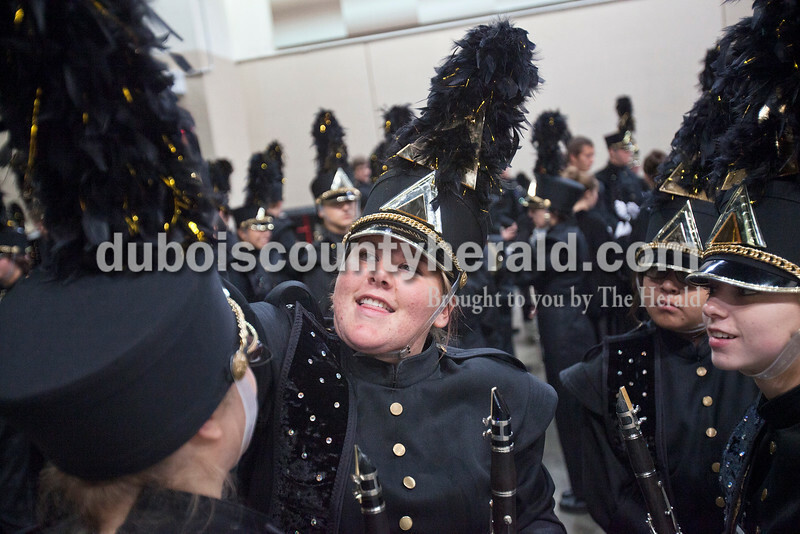 Jasper sophomore Maddi Roblin laughed as drum majors Courtney Hayden, left, and Olivia June, right, both juniors, tried pinning her hair up to go underneath her marching band hat at the Indiana State School Music Association State Marching Band Finals in Indianapolis Saturday. 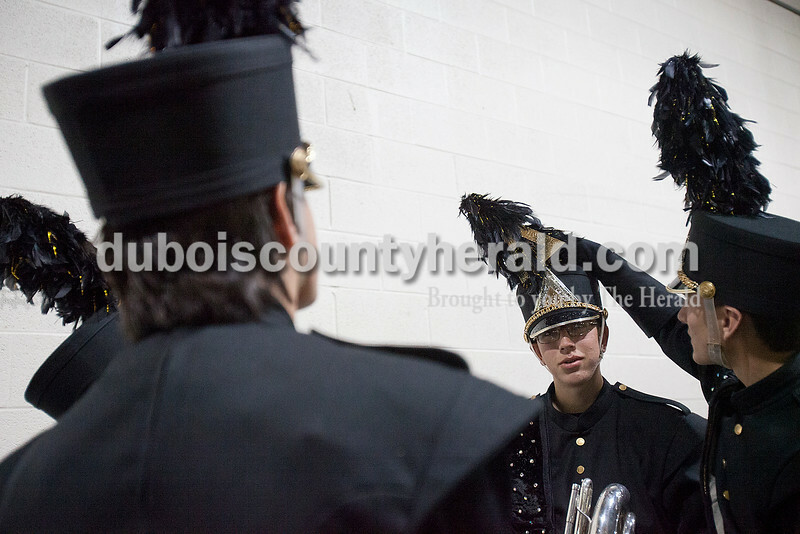 Jasper junior Olivia June adjusted ___'s plume as she walked inspecting the bands uniforms for even the smallest flaws at the Indiana State School Music Association State Marching Band Finals in Indianapolis Saturday. 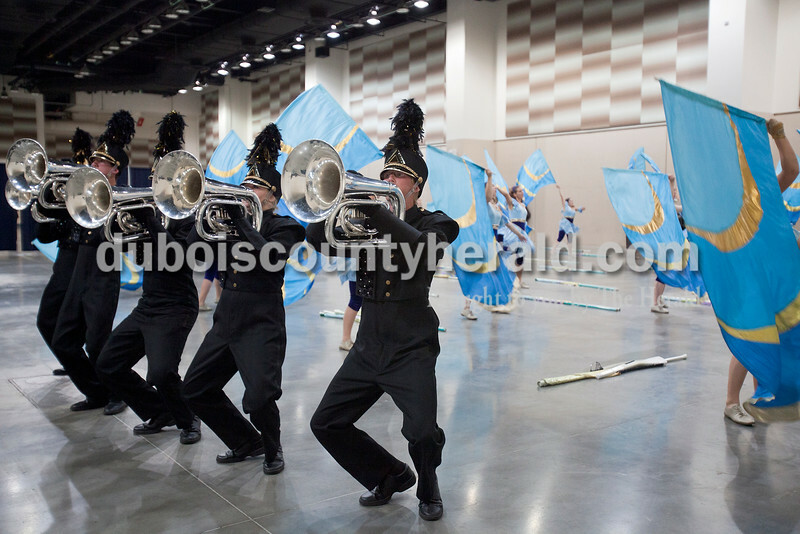 Jasper drum majors Courtney Hayden, Avery Charron and Olivia June, all juniors, warmed up their hands at the Indiana State School Music Association State Marching Band Finals in Indianapolis Saturday. 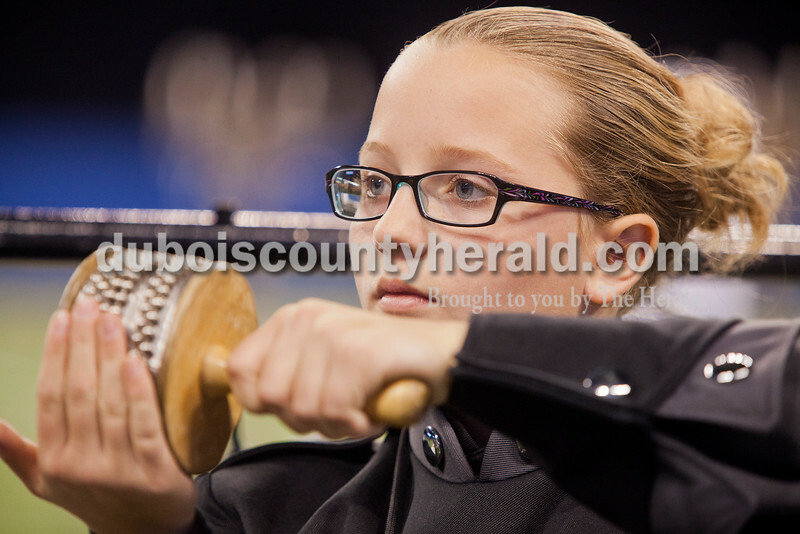 Jasper feshman Maria Johnson kept her eyes on locked on the drum major during a silent warm ups at the Indiana State School Music Association State Marching Band Finals in Indianapolis Saturday. 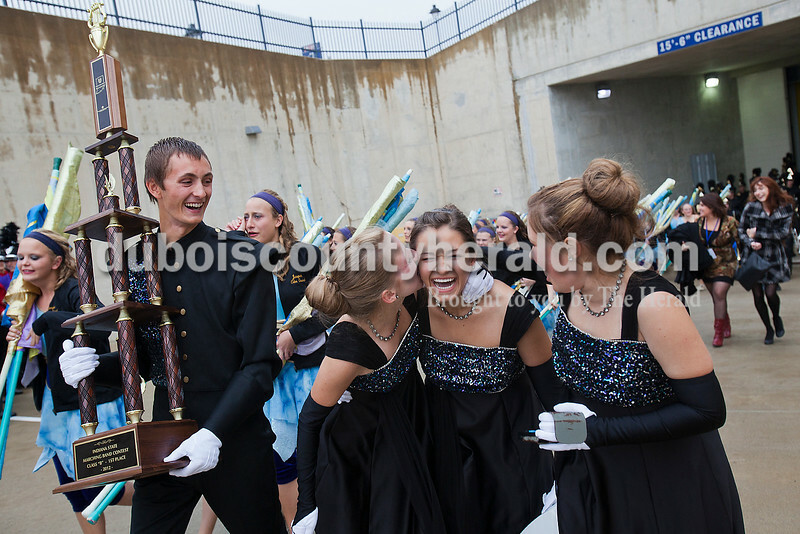 Forest Park drum major junior Travis Vonderheide shouted out with sheer happiness as he carried the Rangers' first place trophy as he led the marching band and color guard off the field after winning State Championship at the Indiana State School Music Association State Marching Band Finals in Indianapolis Saturday. 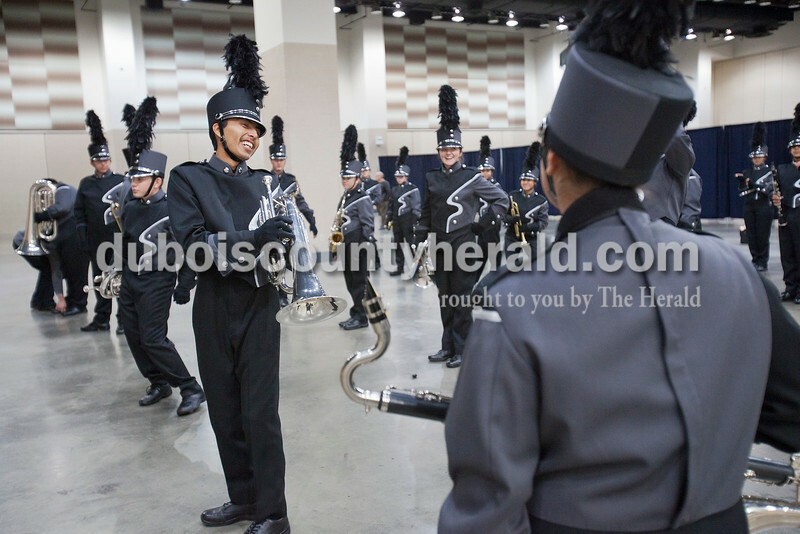 Southridge senior Irvin Rocha stretched out his lower back while warming up at the Indiana State School Music Association State Marching Band Finals in Indianapolis Saturday. 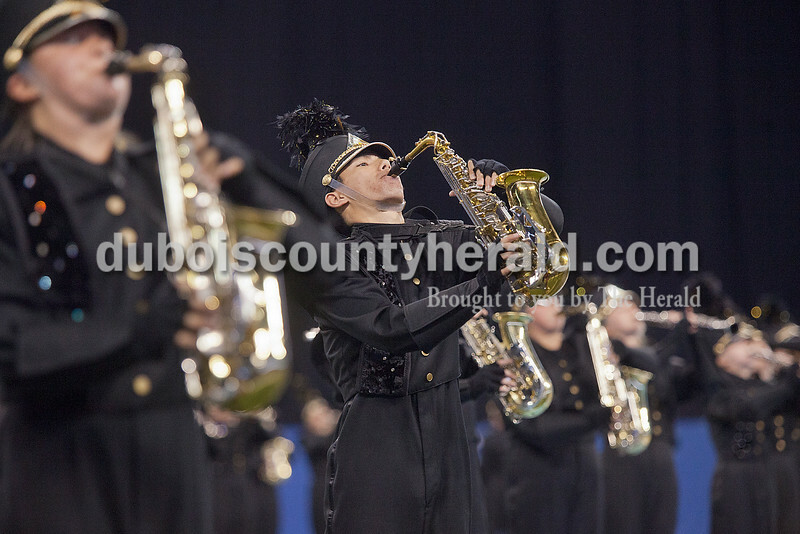 they exited Lucas Oli Stadium carrying their first place trophy at the Indiana State School Music Association State Marching Band Finals in Indianapolis Saturday. 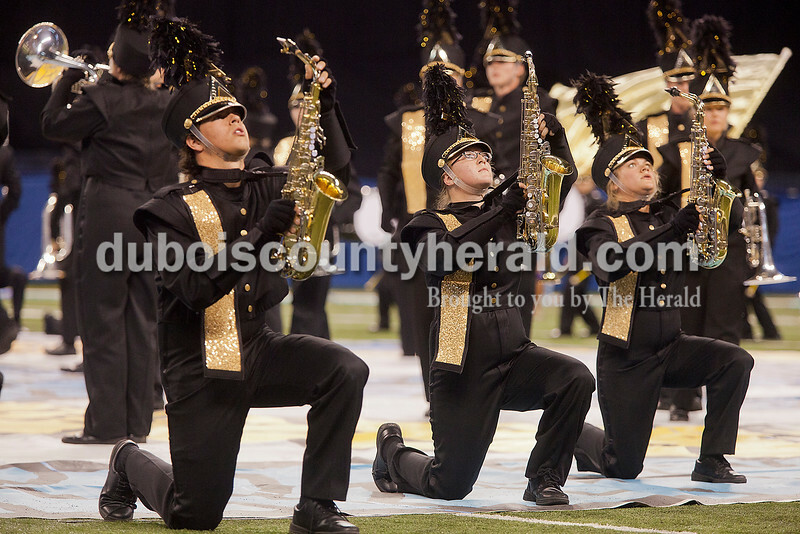 Forest Park saxophonists squatted in sync during their performance at the Indiana State School Music Association State Marching Band Finals in Indianapolis Saturday. 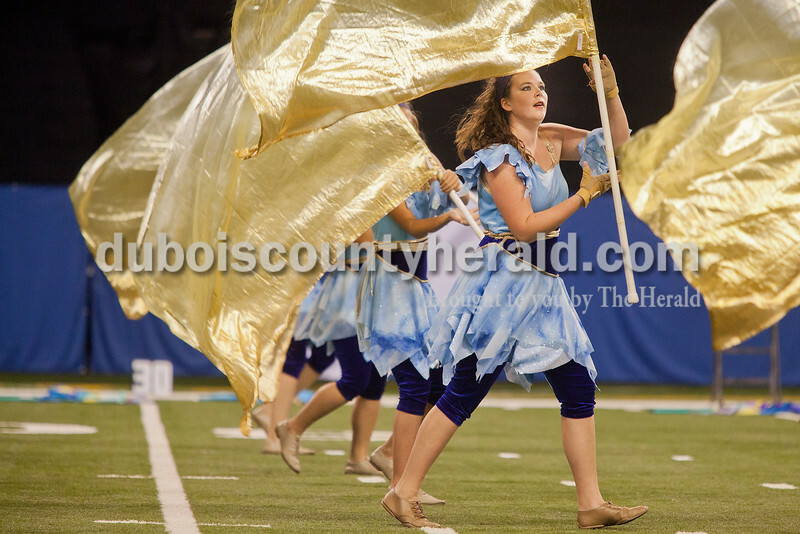 Forest Park color guard senior Brittney Buechler danced amidst the golden flags during the Rangers' performance at the Indiana State School Music Association State Marching Band Finals in Indianapolis Saturday. 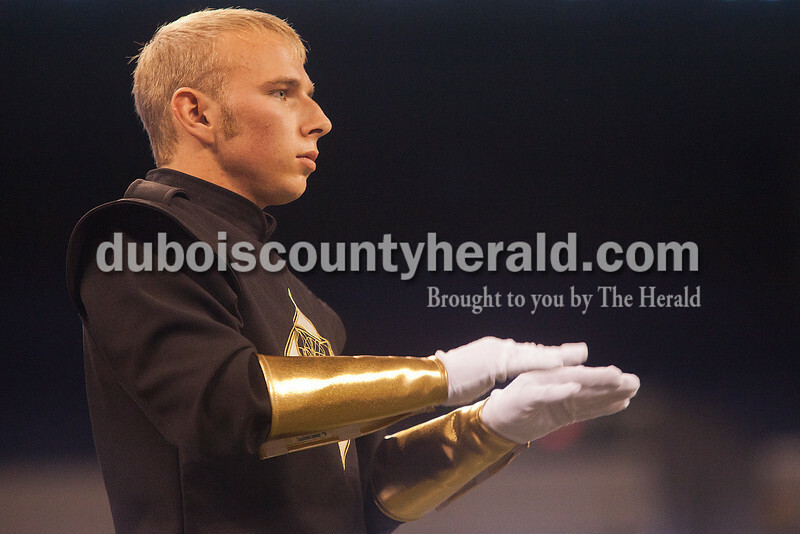 Forest Park drum major junior Travis Vonderheide conducted the Rangers' marching band at the Indiana State School Music Association State Marching Band Finals in Indianapolis Saturday. 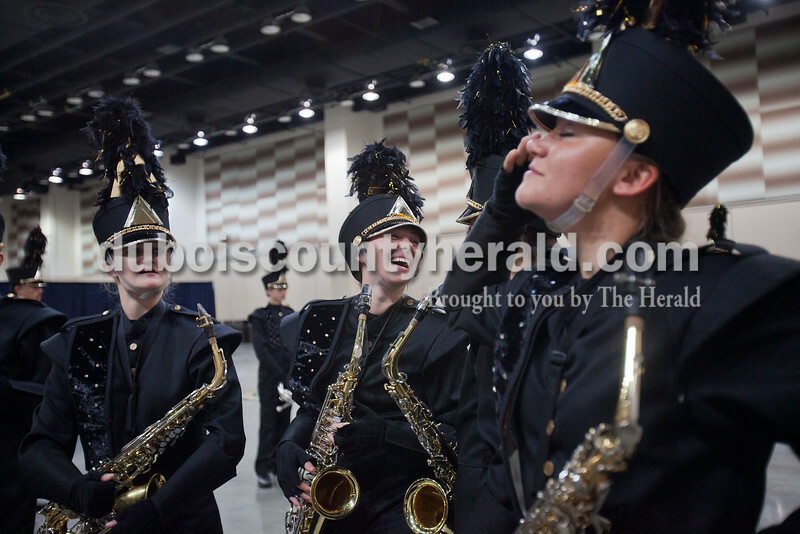 Jasper junior Kendra Corn helped senior Rachel Fisher with some last minute adjustments while junior Emily Schueler and freshman Chelsea Mendez watched at the Indiana State School Music Association State Marching Band Finals in Indianapolis Saturday. 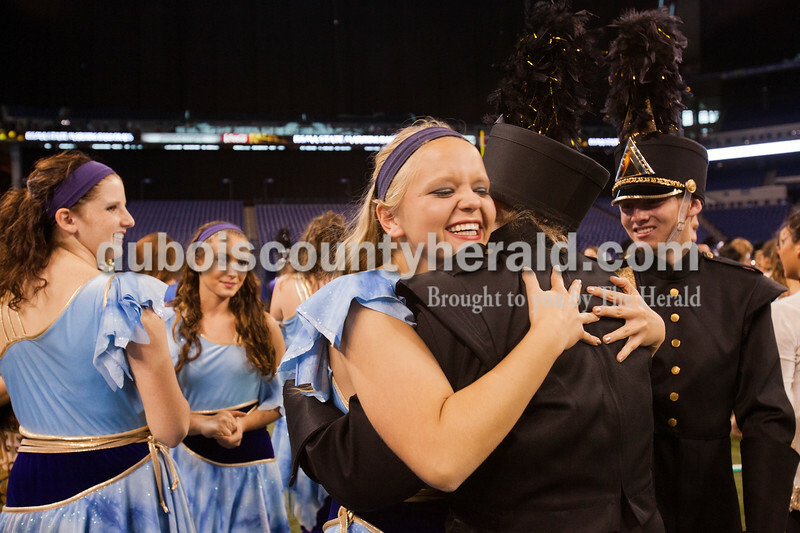 Hugs were plentiful as Jasper color guard senior Melanie Martin celebrated with members of the marching band after claiming first place at the Indiana State School Music Association State Marching Band Finals in Indianapolis Saturday. 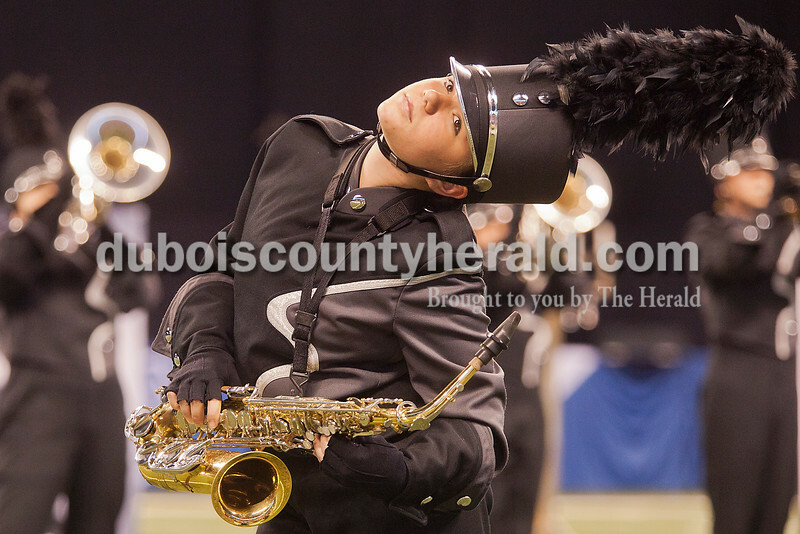 Southridge sophomore Theresa Stetter danced to the rhythm while carrying her saxophone at the Indiana State School Music Association State Marching Band Finals in Indianapolis Saturday. 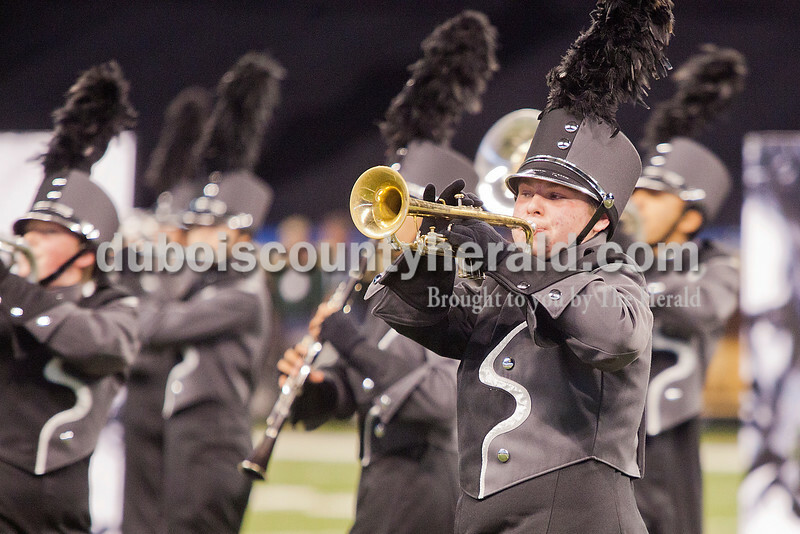 Southridge freshman Gage Kunz marched while playing the trumpet at the Indiana State School Music Association State Marching Band Finals in Indianapolis Saturday. 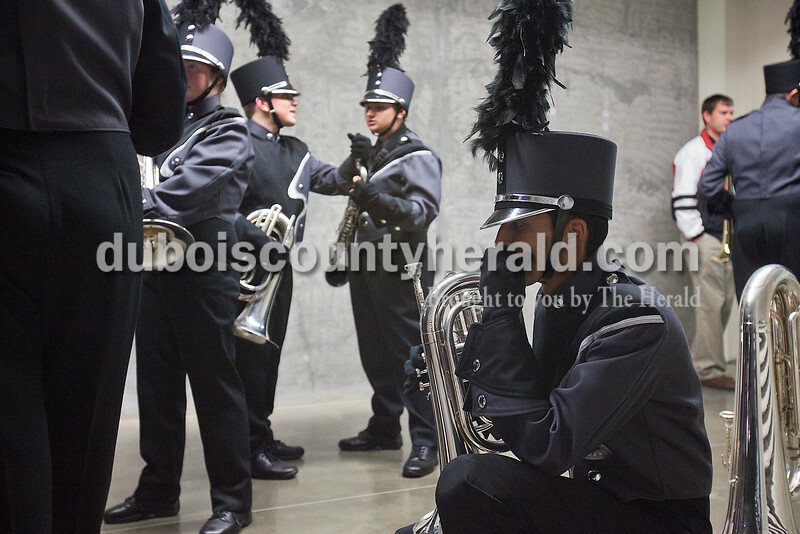 Southridge senior Irvin Rocha took a moment of silence before Sthe Raiders took the field to perform at the Indiana State School Music Association State Marching Band Finals in Indianapolis Saturday. 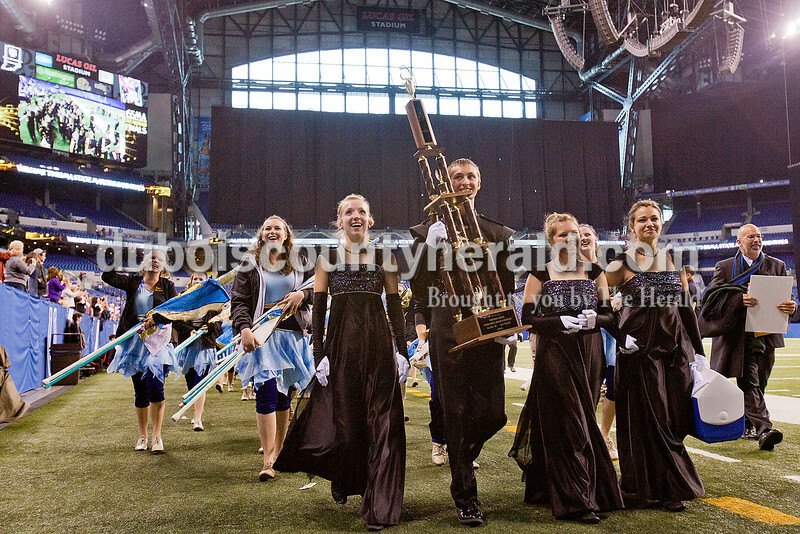 Forest Park color guard members soaked in their victory after winning 1st place during the award ceremony at the Indiana State School Music Association State Marching Band Finals in Indianapolis Saturday. 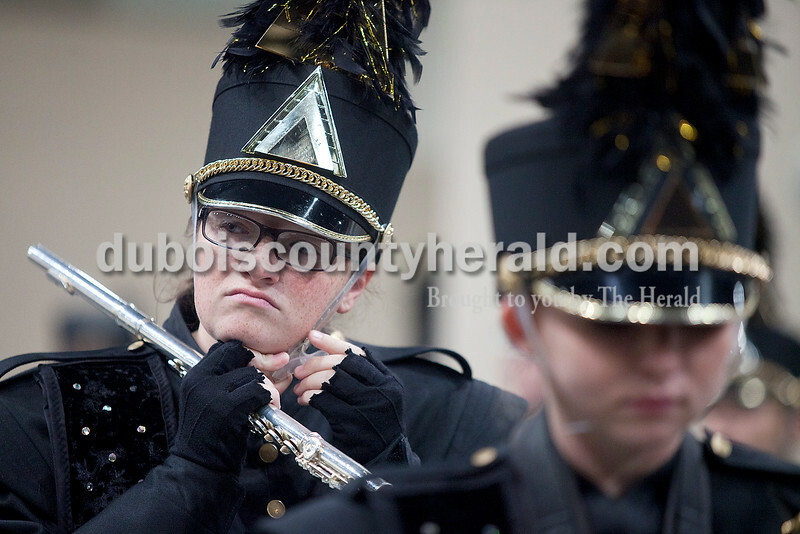 Southridge color guard senior Shannon Phillips struck a pose as she performed with the Raiders marching band at the Indiana State School Music Association State Marching Band Finals in Indianapolis Saturday. 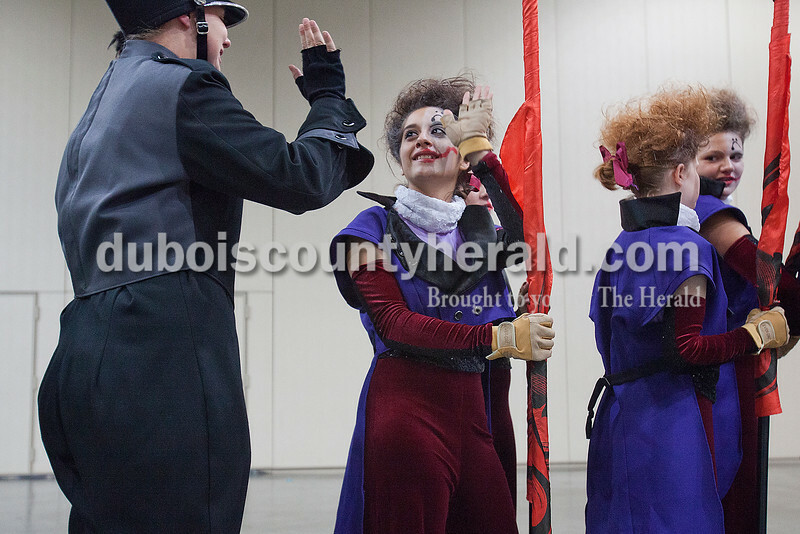 Southridge color guard Emily Calderon high-fived a member of the marching band as they lined up in preparation to perform at the Indiana State School Music Association State Marching Band Finals in Indianapolis Saturday. 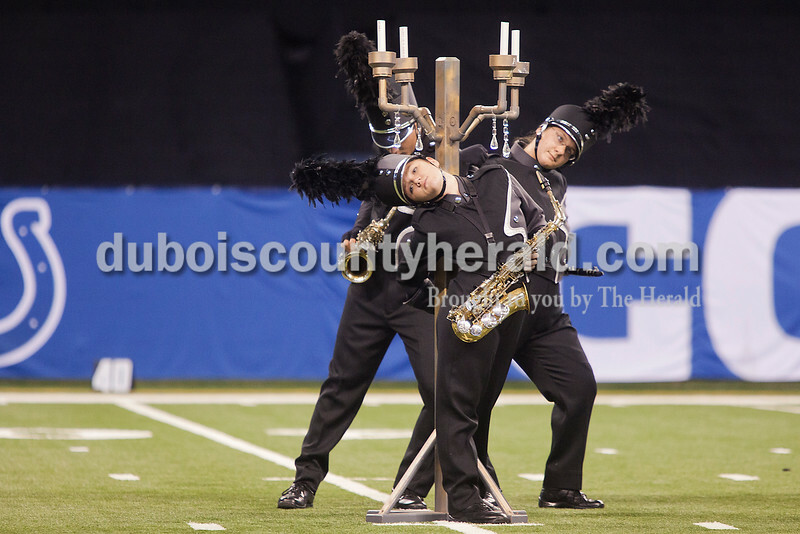 Southridge sophomore Theresa Stetter, center, senior Olivia Schilling, right, and junior Brayden Meyer danced next to a candelabra during their performance at the Indiana State School Music Association State Marching Band Finals in Indianapolis Saturday. 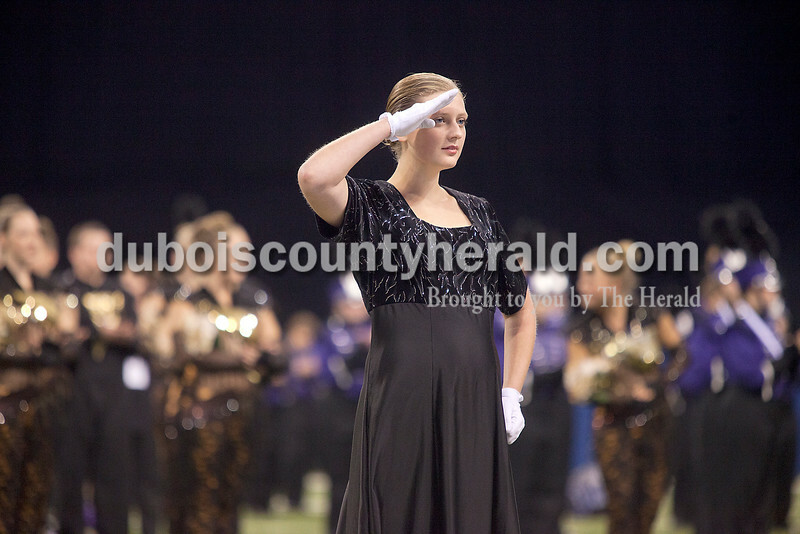 Southridge drum major senior Kaelyn Smith saluted the audience as the Raiders were announced during the awards ceremony at the Indiana State School Music Association state marching band finals at Lucas Oil Stadium in Indianapolis on Saturday. 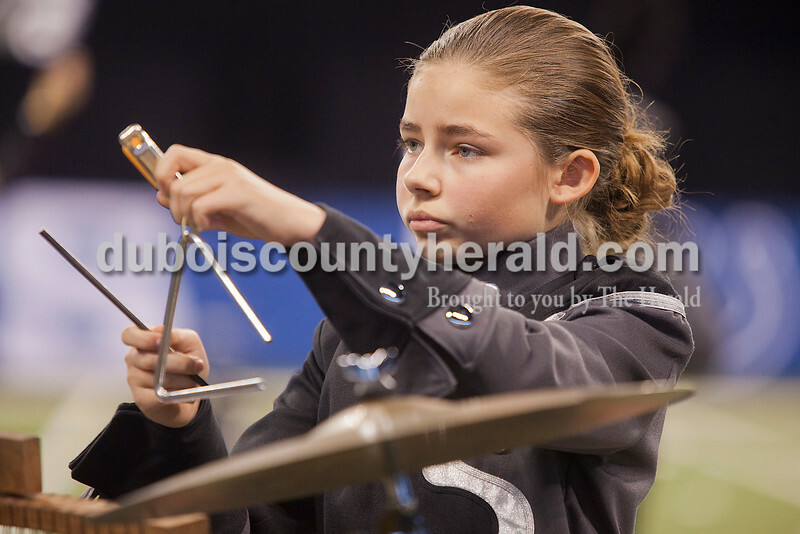 eighth grader Amy Troesch after the completed their performance at the Indiana State School Music Association state marching band finals at Lucas Oil Stadium in Indianapolis on Saturday. 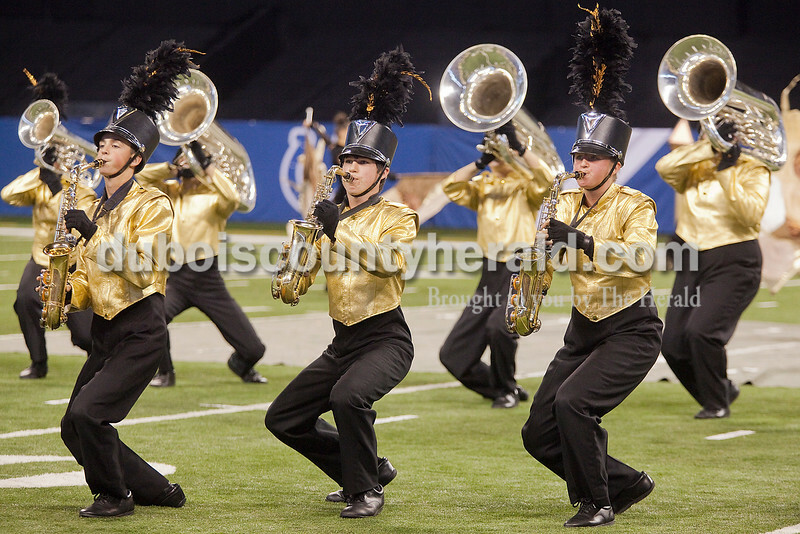 Forest Park marched diagonally as they performed at the Indiana State School Music Association state marching band finals at Lucas Oil Stadium in Indianapolis on Saturday. 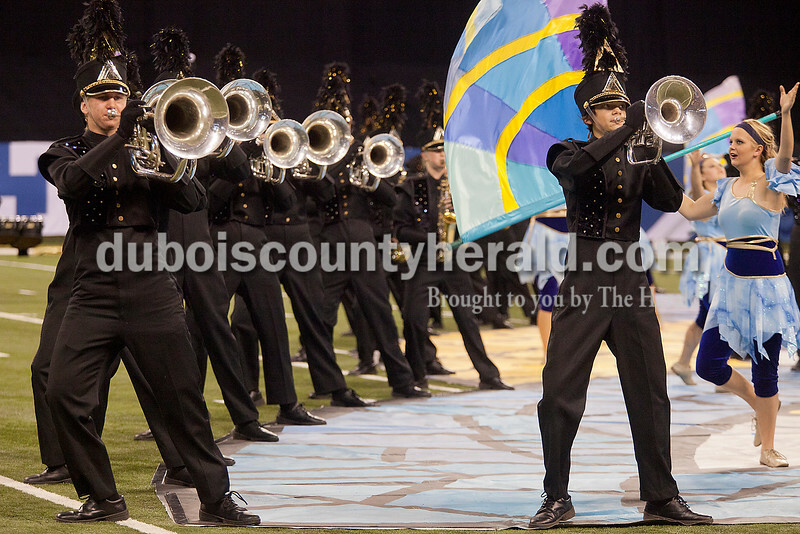 Forest Park color guard performed at the Indiana State School Music Association state marching band finals at Lucas Oil Stadium in Indianapolis on Saturday. 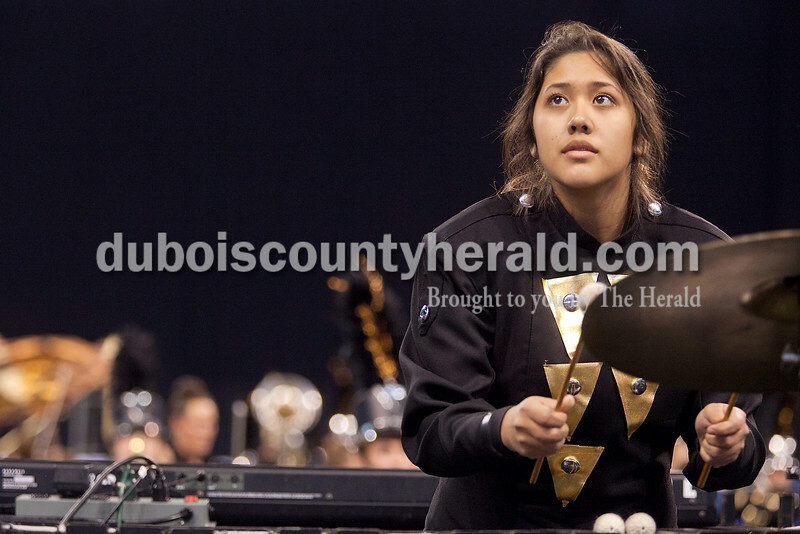 Southridge senior Araceli Garcia looked up for a moment to check tempo with the drum major as she played the marimba during the Riaders' performance at the Indiana State School Music Association state marching band finals at Lucas Oil Stadium in Indianapolis on Saturday. 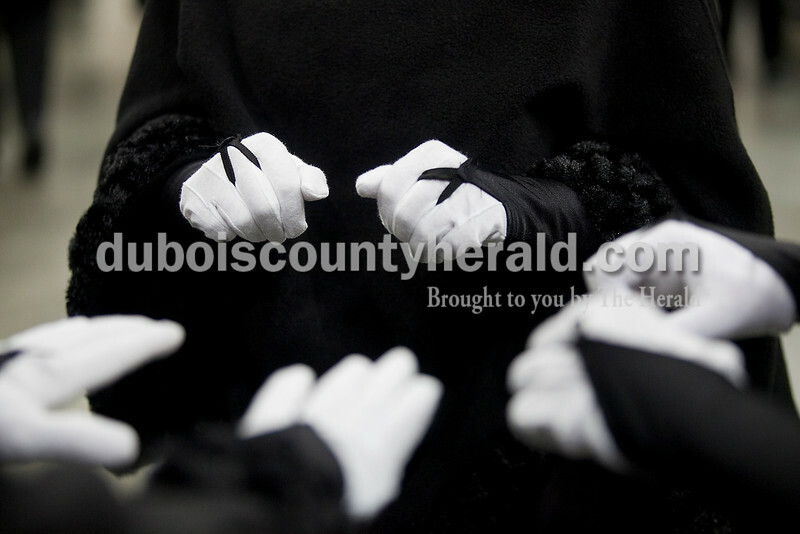 Jasper native John Klingel used a zip tie to bunch together alstroemeria flowers as he gave a presentation at the Dubois County Museum on Saturday. 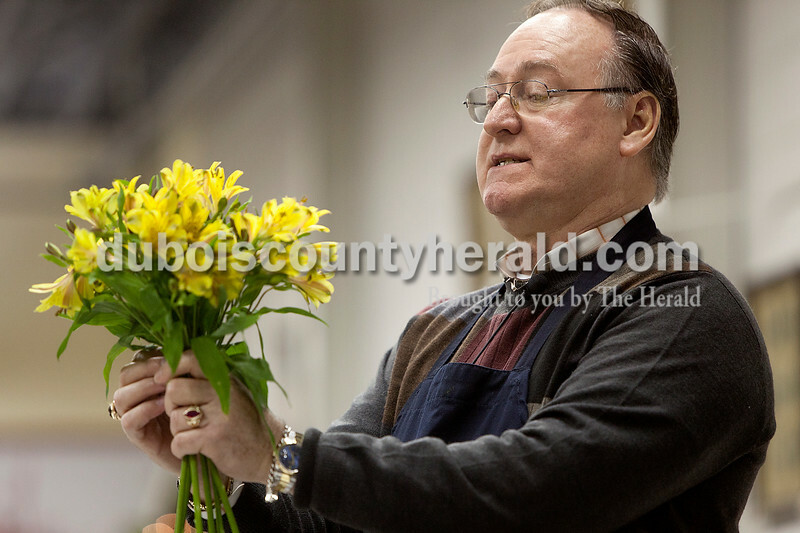 Klingel, who was visiting from Palm Beach, Fla., where he runs a school for students to learn the art of floral design, has written a book called "The Frugal Florist." 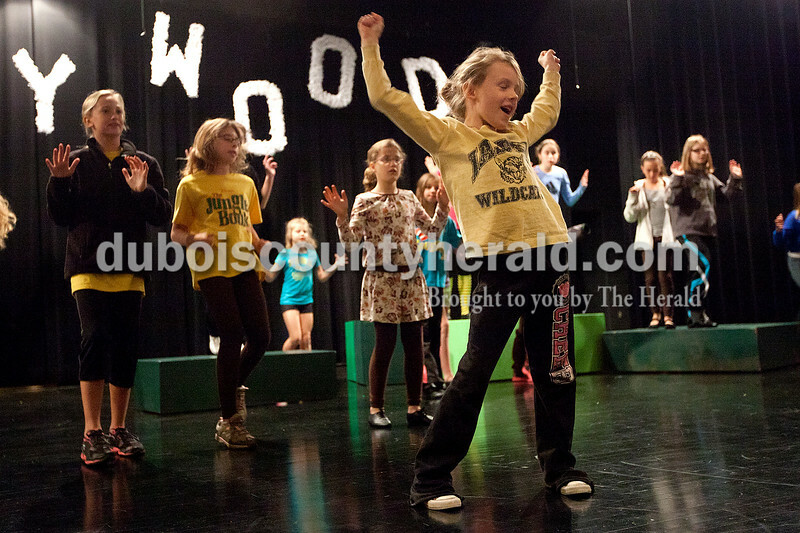 Lauren Hayes of Jasper, 7, right, danced while belting out the song as she performed with 42 other children from Dance Central Academy of Performing Arts as they rehearsed their performance of "The Jungle Book" on Saturday at the Jasper Middle School. Lauren plays the role of "Mowgli." 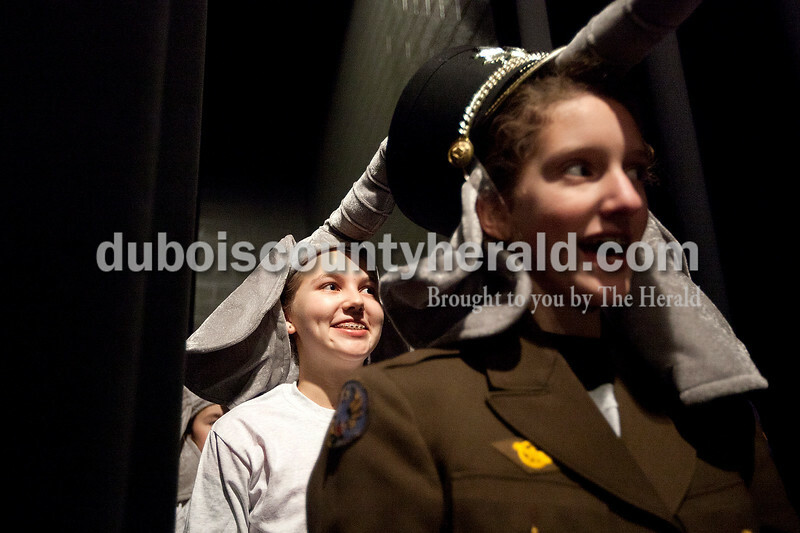 Anna Wagner, 13, left, and Emma Grow, 12, both of Jasper, waited offstage in their elephant costumes for their cue to enter the auditorium stage during a rehearsal of "The Jungle Book" on Saturday at the Jasper Middle School. 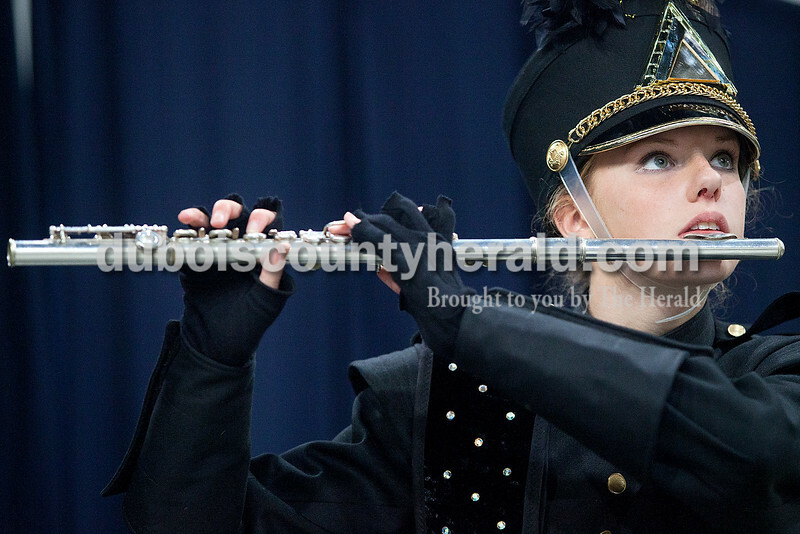 Forty-three area children will be performing in the musical presented by Dance Central Academy of Performing Arts at the school auditorium. 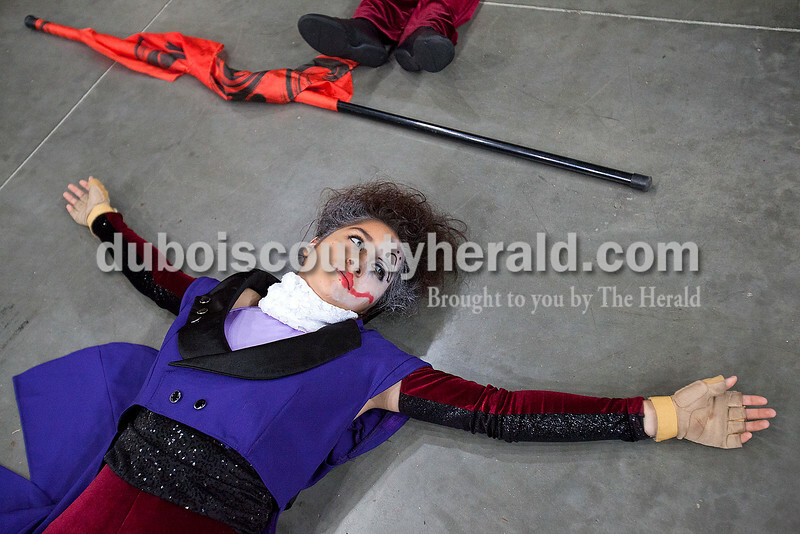 Performances are at 3 p.m. and 5 p.m. on Saturday, and at 3 p.m. on Sunday. 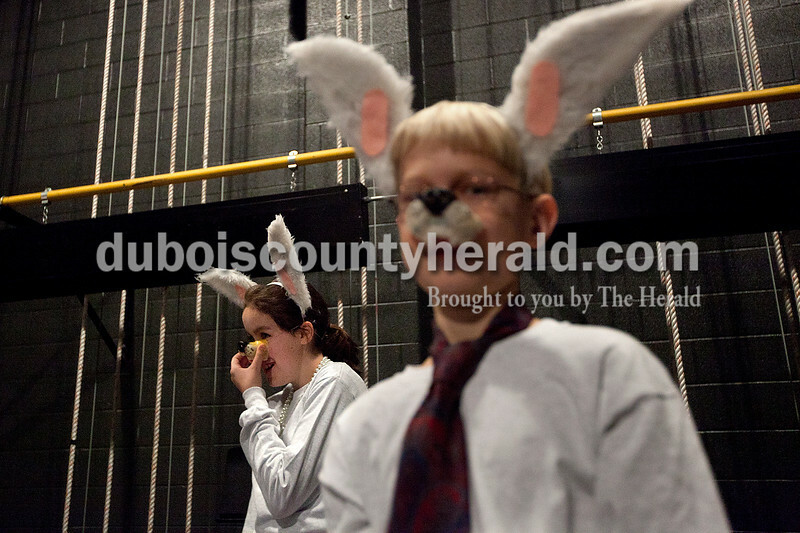 Miranda Keller of Dale, 11, left, and Ben Hochgesang of Jasper, 11, waited backstage dressed as wolves during a dress rehearsal for "The Jungle Book" on Saturday at the Jasper Middle School auditorium. 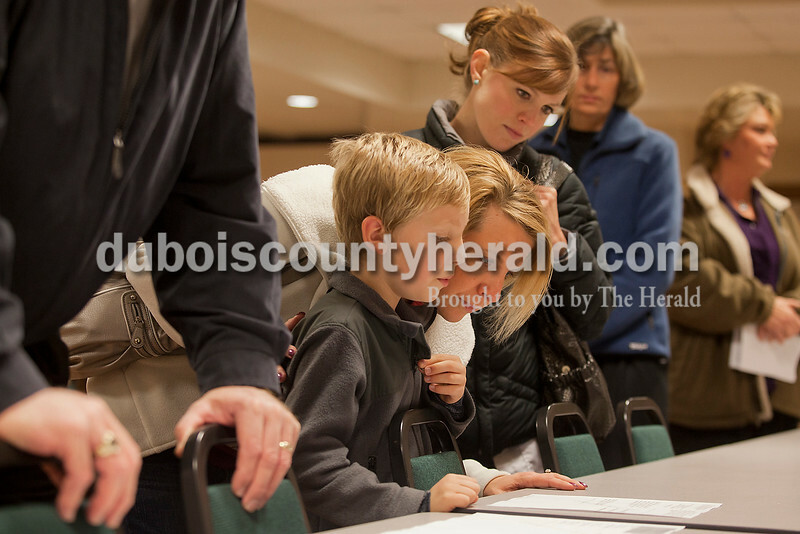 Michelle Bonner of Jasper leaned down to listen to her son, Julian, 7, ask her a question as they read the ballot issues while in line to vote next to Kendra Rottet and Kathy McClain, both of Jasper, at the Habig Community Center in Jasper on Tuesday.